We sat down with ASHG member Karlene Coleman, BSN, MSN, CGC, AGN-BC (Advanced Genetics Nurse – Board Certified), to learn more about her work providing genetic counseling, running a specialty clinic, and educating health professionals. Karlene: My position has two main parts: the first is that I follow up on and provide genetic counseling for genetic testing ordered through the Marcus Autism Center, which is the largest clinical center for autism care in the U.S. Second, I created a specialty clinic for 22q11.2 deletion back in 2006, and we have now seen over 700 families. I also give lectures in multiple training programs at Emory, including the Schools of Medicine and Nursing. 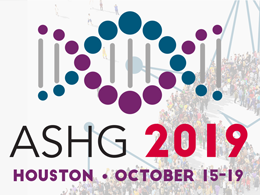 Karlene: I am a member of ASHG and the American College of Medical Genetics (ACMG), so I attend the annual meetings for both and read many journal articles from each. I also get GenomeWeb alerts. In addition, I am a member of the International Society of Nurses in Genetics (ISONG), and use their newsletters and webinars. Karlene: Of course I use OMIM, GeneReviews, and Genetics Home Reference at NIH regularly. I also use a new site called ThinkGenetic, developed by a colleague at Emory, which is to help educate families and guide them through symptoms to come up with questions for their doctors or to self-diagnose genetic conditions. Karlene: We are using developmental questionnaires in our 22q clinic to identify the needs of the children over time, and we just submitted an abstract to ASHG 2017 looking at the reliability of these measures. Karlene: Serving as a resource for people all over the region on what to do and where to refer when they need to help specific patients. I just got a call yesterday from one of our physician liaisons after I had given them a lecture several weeks ago, and they are already calling to make referrals. It’s great! Karlene Coleman, BSN, MSN, CGC, AGN-BC, is a Clinical Nurse Coordinator at the Marcus Autism Center at Children’s Healthcare of Atlanta. She has been a member of ASHG for over 20 years.